If you were to think of University Canada West's (UCW) newest honorary degree recipient as a book, his true depth would likely escape you, unless you knew him as a book with many covers. Tom Lavin, UCW's 2016 honorary degree recipient, and the university's 11th to date, is primarily known as an accomplished musician and record producer who was a founding member of Canada's legendary Powder Blues Band in 1978. On July 15 in a convocation ceremony that begins at 11 a.m. at Vancouver's Italian Cultural Centre, Lavin will formally be awarded his UCW degree before the university's 28 graduands of 2016 are granted theirs. UCW President Arthur Coren will preside over the one hour and 15 minute ceremony, which concludes with a reception at 1 p.m. Media and the public are invited. Despite major record labels' initially cool reception of the Power Blues' debut album, Uncut, the now world-famous band has gone on to sell more than one million records worldwide and has toured continuously for the last 38+ years. Known for its mix of swing, blues, jazz, rock & roll and r & b that gets people of all ages bopping, the band's sound has garnered numerous international awards. Among the highlights are Canada's Juno in 1981, Canadian Music Industry Association (CMIA) awards for Guitarist, Singer, Songwriter and Producer of the Year in 1980 and the LA Reader Award for the Indie Film Score of the Year-Dennis Hopper's film Out of the Blue in 1980. Lesser known are Lavin's achievements as a high tech, venture capital consultant, CEO of several public companies and founder of a private college. In 1992, the Chicago-born blues musician was appointed managing director of a film SFX software firm at George Lucas' Lantana Complex in Santa Monica, California. In 1994, Lavin started one of the first Internet services in Canada (Axion.net) and took it public on the Canadian Exchange (CDNX). In 1999, he founded and wrote curriculum for Pacific Audio Visual Institute (PAVI), a government-accredited private post-secondary technical college, and acted as its director until its sale in 2015. Ironically, UCW purchased much of PAVI's classroom and office equipment. Lavin's Socratic approach to learning is the likely architect of the many covers that would have to adorn any book telling his professional story. "Learning, musically or otherwise, is all about exploration," says Lavin, who moved to Vancouver in 1969 to study film and work as a recording studio musician. "There is a time and place for learning in solitude, in pairs and in groups, however, first and foremost to me is the importance of 'beginner's mind' -being able to approach an investigation without preconception." "For example, my music production generated an interest in echo, which led to my pursuit of digital delays. This in turn caused me to investigate digital information packets, which resulted in my creating one of Western Canada's first public Internet services," offers Lavin about his learning journey. But Lavin admits it's not just his gift for connecting ideational dots that has propelled his Renaissance man-like career path. It's his passion for business communication, a very fitting attribute for UCW graduands to emulate going forward into the business world. "A famous successful jazz musician once said that the music business properly pursued is 50 per cent music, 50 per cent business. I think this can apply to all fields. It's not enough to have a great idea; one needs to be able to communicate the concept," advises Lavin. "Be ready and able to share your vision verbally in three minutes. Refining a statement like this will also aid in making it clear to yourself what your true goals are." 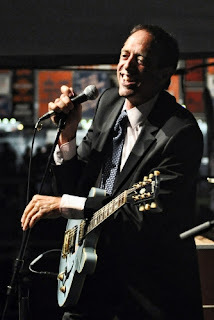 •"Tom Lavin is a fabulous musician who`s made a large contribution to music and Canada. As a bandleader he should be used as a model for others in that position. Those fortunate enough to work with him are treated with respect and dignity." •"Tom Lavin accomplished the amazing feat of bringing not one, or two, but many blues songs to mainstream radio. I cannot believe this has gone unmentioned for this long. He defined for me what a Canadian blues guitarist sounded like. I love the guy. Congratulations Tom!" •"Not only being a wealth of knowledge, Tom brought to Canada the soul of a true Chicago blues man. His songs and voice evoke true artistry."